And you think you are slow....!!! @brettacarr, Dan provided me with your details so that I could check for updates with our Networks team. They've confirmed that unfortunately the upgrades have been delayed by another month I really do apologise that its been pushed back. It's still definitely on track to be completed as soon as they can and I thank you for your patience. @mikef56, it might be best to chat with our Tech Support team on 131344 as there could be multiple nodes in your area and they'd need to confirm what one you are connected too and if its impacted and provide any updates. Thanks for the reply! It's really good to have someone listening. I trade shares during the morning, and my connection is so slow, that I've been unable to effect orders to buy/sell in a timely fashion. I've called the Tech Support Team tonight, as suggested, (30 min wait), and have been advised that there were multiple nodes running in my area, and all are heavily congested. The Team have logged my complaint, and are working torwards a resolution by moving me to another exchange with less traffic, and / or installing anew exchange to handle the traffic. All this will take time, but I trust Optus will do their best under the circumstances. Optus has credited my account the equivalent to 10 weeks Premium Speed Pack service charges ($50)....I hope this issue is fixed earlier that that! 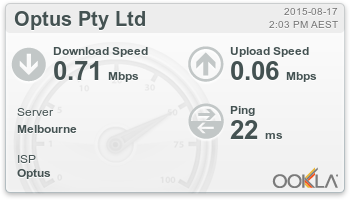 This is the WORST download speeds I have seen and I have been an Optus Cable customer for too long to remember. Might be time to go elsewhere. Ever since changing to the "unlimited bundle", and with Optus offering Fetch/Netflix services, my speeds have dropped dramatically, to the point of streaming Youtube videos is unbearable, with constant buffering. Looks like everyone gets home at 6:30pm in Carlingford.......My speeds drop off a cliff at 4:00pm every weekday, and never improve through the weekend. I am in Glen Waverley Victoria. This cable broadband service is the worst its been and it has been slow for more than 6 months. I have been told they are working on some upgrade for the area, and it was meant to be completed at the end of July. However nothing has changed. The speed is atrocious. What can be done ? Isnt there a minimum speed you will guarantee? Also we are paying full price for the worst possible connection speed. I will be expecting some sort of refund considering how much we are paying. Please have a look at the speed. Now tonight the speed is just a joke. A DOWNLOAD SPEED of 0.71 Mbps..... How much are you going to compensate me for this ridiculous service? I have also spoken to your technicians multiple times and they go through the same process. They just reconfirm that it is just congestion.... if thats the case then I should switch to a better service provider. My speed has improved in the past week. Ive done a few tests in the evenings latly including Saturday and seem to be getting aroud 70Mbps download speed conisitantly. Think the upgrade might have finally happened, either that or people are laying off Netflix. Anyone noticed any improvements in the Eastern Suburbs in Melbourne? NOPE. Internet is RIP. not a single improved in Yarraville, anything a even slower speed. isn't it nice when you get a 7 day game ban because you lagged out? no? i hate this company most times.